« Will AusKick be axed ? A Football Jumper is not just for Christmas . 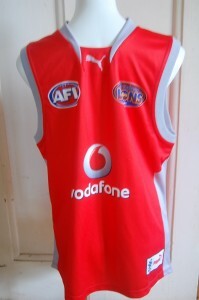 It can be worn anywhere , anytime , in AFL obsessed Melbourne Town . 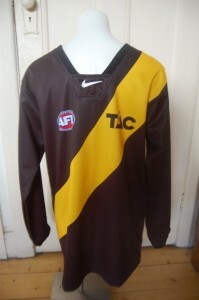 In fact , anywhere AFL football is played , a football jumper , jersey , guernsey, is considered a must have item , in the wardrobe . Summer , is fast approaching , as is Christmas . What better gift idea , than a new , or vintage football jumper , jersey , guernsey , tucked into the Christmas stocking . Why I wouldn't be surprised, if Santa , makes his rounds this year, wearing a Collingwood, football jumper , jersey , guernsey . They have so many fans , particularly after their recent success , I think Santa , may be a closet Magpies fan . Shh! don't tell the elves though , or he could have a revolt at the North Pole . Make sure you buy the real thing . There is no comparison between an authentic , licensed with sponsors , just like the players wear, footy jumper, to a cheap imitation knock off . Recipients of the jumper , will know the difference , and to quote that old advertisement , for arnotts biscuits " there is no substitute for quality ". This entry was posted on Tuesday, November 9th, 2010 at 8:08 am	and is filed under AFL, football jumpers, NRL. You can follow any responses to this entry through the RSS 2.0 feed. Both comments and pings are currently closed.